It's a beautiful day here in Parker Lakes - a cool sixty-something degrees with plenty of sun and hardly any humidity - quite a change from last weekend. I'd better enjoy it while it lasts. My day started with my usual early morning trip to the gym with hubby Bill. I actually enjoy exercising these days - even though it is no longer an optional activity. Well my plan is to get out there and meet people - and their dogs and take pictures. Frankly, I'm nervous. Will I be able to get that close to all those animals? Will people think I'm crazy or worst yet, a stalker with criminal intent? If this blog disappears tomorrow - you'll know the answer. Birds. I like birds. 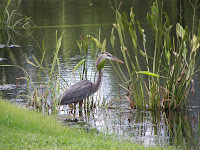 The heron pictured here was shopping for dinner by the lake behind our condo. He is my test picture as I learn to up-load images to this blog. I'm not a photographer, but maybe I'll learn as I go along. And by the way, I'm the world's worst speller so bear with me. I think I'll start my dogs with Dozer, the Bull dog (get it - BULL DOZER). He lives in the condo next door with his owner, Lindsey. Every time we leave the house Dozer leaps at his door and I'm sure he is going to come through it. When I see them out walking, he growls and barks. Bill assures me that he is just a puppy and quite harmless. Easy for him to say!! Dozer's owner is another story. Lindsay is a beautiful young lady. When I first met her, I wanted to overnight my single 30-year-old son, John down from New York City to meet her. Then she introduced me to her boyfriend, the handsome, muscular fireman, Brad. Oh well.